PaperScan Pro allows you to control any scanner with OCR and Annotation support. While most scanning applications are dedicated to one scanner or one scanning protocol, PaperScan Pro allows you to control any scanner, including network scanners (TWAIN or WIA protocols), cameras or acquisition cards. All features are automatically negotiated and handled by PaperScan Pro. PaperScan Pro provides flatbed and document feeder support. PaperScan Pro allows image rendering quality selection, area selection, crop selected area, image resize, image printing and so on. Batch image processing can be applied during document acquisition. PaperScan Pro displays info about image's resolution, size and colour mode. Acquired or imported files can be easily handled to create multipage or single-paged document files. You can save files in various formats such as PDF, PDF/A, PDF with encryption, TIFF , JPEG, PNG and even PDF/OCR JBIG2. PaperScan Pro provides OCR engine for PDF/OCR (searchable PDF) format saving. Default user interface language in PaperScan Pro is English. 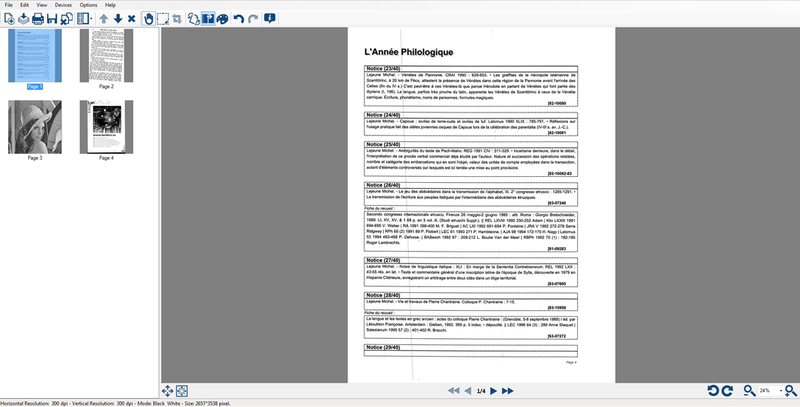 Based on your Windows language settings, PaperScan Pro automatically displays the localized version of the interface, if it exists among PaperScan Pro translated interface versions.Currently, available languages for PaperScan Pro interface are : English and French.